Shape Moth: 'Deer Purse' and some exciting news! 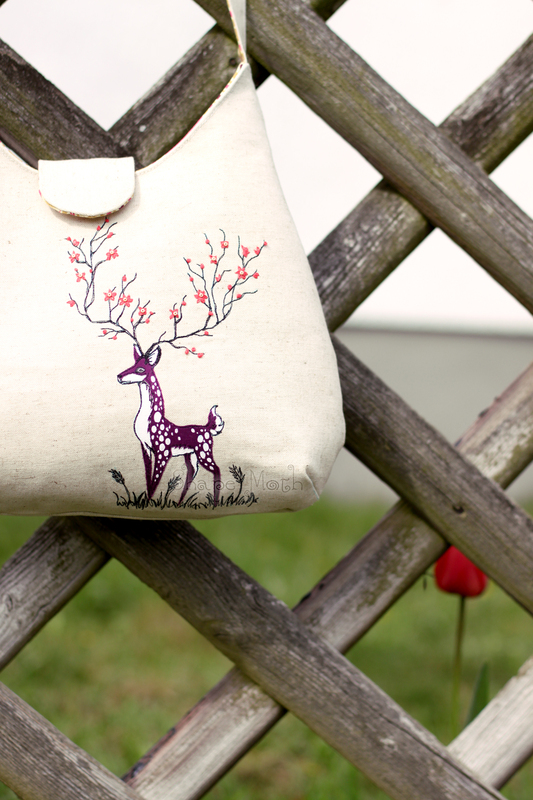 'Deer Purse' and some exciting news! Hope you all had a nice and peacefull Holidays. I was a bit away (from the net and from my sewing machine) during Easter, but now I'm back and ready to sew :) I will also try to answer all your emails ASAP and finish the PP patterns for Carl the Cameleon and the Retro Phone. 1st - the book 'Jelly Roll Dreams: 12 new designs for Jelly Roll Quilts' with my quilt in it ('Driping Diamonds') is now available in shops! You can preview the book at Amazon. Cannot wait to see the book myself with all the amazing projects inside! 2nd - my other quilt will be soon published in Quilters Newsletter! It's an amazing feeling when other people appreciate your work. * ksiazka z moim quiltem z Jelly Roll'ki 'Jelly Roll Dreams: 12 new designs for Jelly Roll Quilts' (moj quilt to 'Dripping Diamonds') juz jest dostepna w sprzedazy! Niektore strony mozna obejrzec na Amazonie. Juz sie nie moge doczekac, kiedy dostane moja kopie ksiazki! Outer fabric is linen, for lining I used Heirloom Gold Ribbon Lattice by Joel Dewberry. The deer is in part applique (using bondaweb) and in part painted with textile paint (all the white parts). The outlines are machine embroidered with black thread with the help of darning foot. 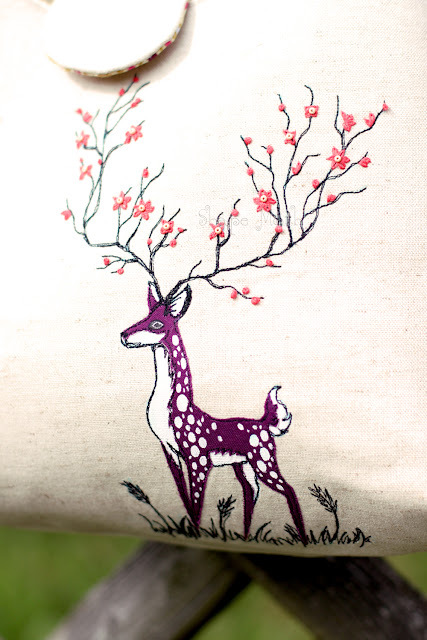 Antlers and grass are also machine embroidered. 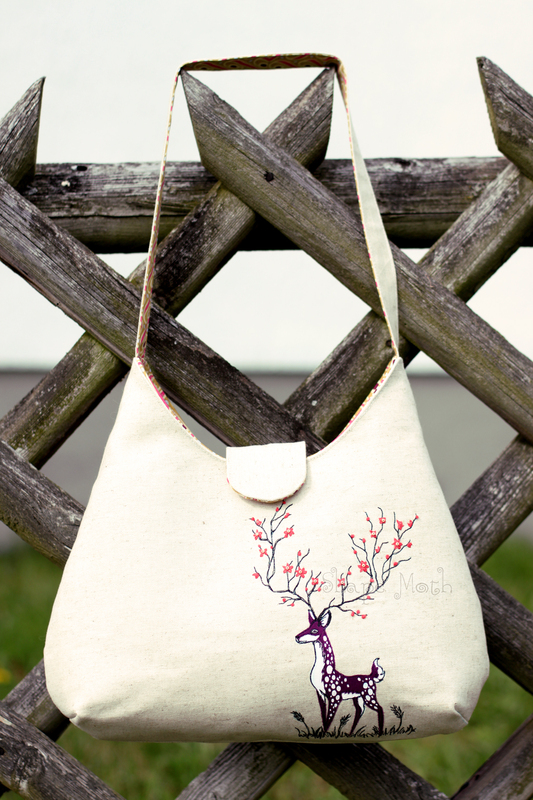 Cherry blossoms are hand embroidered with lazy dazy stitch with some little beads in the middle of some flowers. The purse is now listed in my DaWanda shop. Material zewnetrzny to len, podszewka jest z Heirloom Gold Ribbon Lattice. Jelen jest po czesci aplikacja z uzyciem Bondaweb, a po czesci malowany farbami do tkanin (wszystkie biale elementy). Kontury sa wyszyte maszynowo czarna nicia z uzyciem stopki do pikowania, tak samo trawa i poroze. Kwiaty sa wyhaftowane recznie. Gratulacje. Torebka jest wspaniała, dopracowana w każdym szczególe, bardzo, bardzo mi się podoba. A torebka jest po prostu cudowna! WOW! Such a beautiful bag!!! Very inspiring! Świetne poroże w postaci kwitnących gałązek - super! Excellent job on the deer, it's beautiful. Your purse is beautiful. I love how the deer came out, just stunning! Wow! That is a beautiful bag! Congratulations on having your projects published - how exciting! Beautiful work on the deer. The applique is really beautiful. Congrats on the publications, and I look forward to seeing if I'm one of the people chosen to test your pattern. Have a great Thursday! Just took a look at the book ~ while it didn't have your quilt in the review ~ what I saw looks great! Loving your Deer Purse! It's really lovely! I am waiting for the book to see it:) And how amazing! Quilters Newsletter is my favourite magazine:) When it would be? Gratuluję z całego serca publikacji Twoich wyjątkowych quiltów!!! Your work is exemplary, so why wouldn't we appreciate it? Piękna jest ta torebka!!! Brak mi słów, podziwiam twój talent!!! Wow! 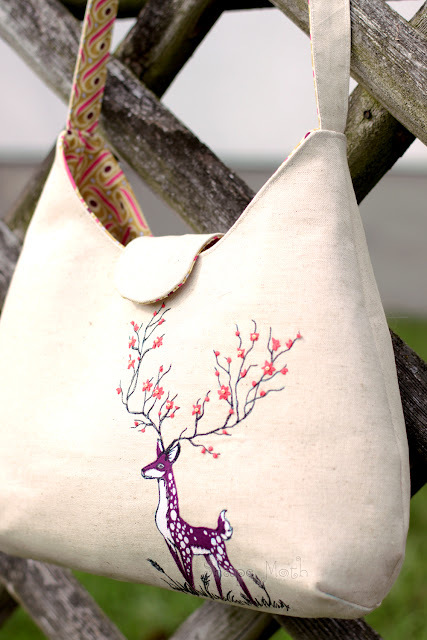 Your bag turned out fabulous, such brilliant work! Congratulations on being published.